Scientist's and doctors alike are baffled at the discovery of an infant that doesn't seem to age. By all account's Brook Greenberg appears to be your average care free and happy toddler, at first glance you would think nothing was out of the ordinary there right?....well you would be wrong. Because baby Brook is not an infant at all, rather she is a sixteen year old girl, who for some reason doesn't seem to age, at least not in the way we normally think of ageing. Brooke just turned 16 in January. She is 30 inches tall and weighs 16 pounds. "Why doesn't she age? said Brooke's father Howard Greenberg. It is that very question that have scientist's so interested in young Brooke! There are many different known ailment's that effect the healthy growth of children, some of which are directly responsible for causing abnormalities such as dwarfism or symptoms of rapid ageing (progeria). 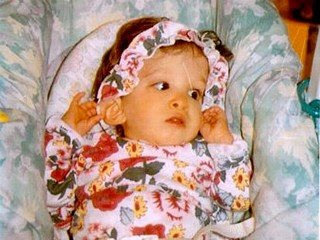 But according to her pediatrician Lawrence Pakula, from the Johns Hopkins school of Medicine in Baltimore, Brooke's case may be unique, Even some of the most well known scientific minds in this field of study are at a lose to explain this case, to date they have never seen a case like this, says Dr. Pakula. Another doctor named Richard Walker from the University of South Florida College of Medicine, in Tampa, says that Brooke's body is not developing as a coordinated unit, rather individual parts seem to be growing out of sync with one another. To date Brooke has never been diagnosed with any known chromosomal anomalies or genetic syndrome's. Dr. Walker along with two of his fellow scientist's, Lawrence Pakula and Maxine Sutcliffe, a geneticist from the All Children's Hospital in St.Petersburg, FL. Recently co-authored a paper for the journal "Mechanisms of Ageing and Development." In this article they say that there were a number of odd occurrence's related to Brooke's growth.... Throughout her life there has been very little change in her brain and cognitive function, and her various body parts arms, legs...etc seem to age at a slightly different pace then the other rather then maturing at the same pace, they also noted that her bone structure seems to be about 10 years old, and even though she is now 16 years old she still has her baby teeth. Melanie Greenberg Brooks mother says, "She loves to shop"
Brooke rides along in the stroller whenever her mother goes shopping. "That Brooke is in her mid-teens is so mind boggling that if another mother with a toddler asks how old she is?, she usually doesn't try to explain it." "My system has always bee to turn years into months." She said that way if some one asked today i mite say she's 16 months old." Brooke's family consists of her mother and father Melanie and Howard Greengerg and her three sisters 22 year old Emily, 19 year old Caitlin and 13 year old Carly, all of which are of an average size. "She looks like a 6-month old, but she kind of has the personality of a 16 year old." "Sometimes we joke about how she rebels." said Caitlin. Brooke will resist and refuse activities that don't appeal to her by vocalizing her displeasure, not with words. but with sounds typical of an infant. "She makes it known what she likes and what she doesn't like." said Emily. It no longer seems strange to have an older sister who is still essentially an infant. "As i got older she was just like another little sister to me." If you would like to know more about Brooke watch ABC's 20/20 this Friday June 26 at 10:00pm EST. Brooke's story, a documentary about Brooke's and her amazing story will also be airing on TLC on Sunday August 2 at 9:00pm check your local listings for the correct time in your area.